Catalog # 1449 was labeled as a Yellow-bellied Sapsucker (Sphyrapicus varius). 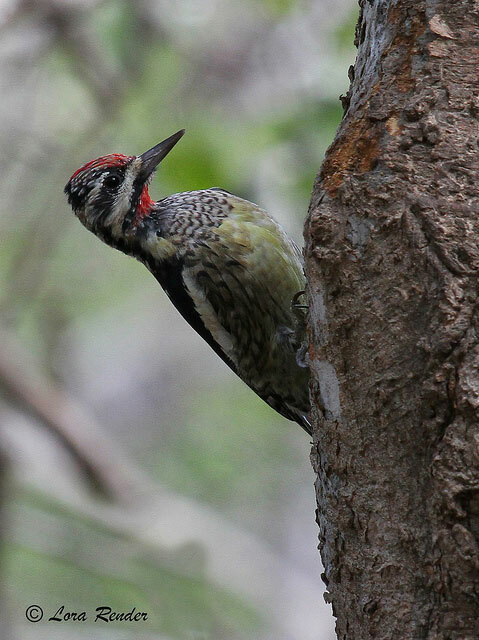 However, this adult male had the field marks of a Red-naped Sapsucker (Sphyrapicus nuchalis). While these two species can be problematic in the field, adult males in the hand can normally be easily identified. This specimen was collected in Coahuila, Mexico in 1940. Red-naped Sapsucker, Catalog #1449, on left. Yellow-bellied Sapsucker on right. The Red-naped Sapsucker on the left has red feathering that bleeds into the black malar stripe. Red-naped Sapsucker on left. Yellow-bellied Sapsucker on right. The Red-naped Sapsucker on the left frequently, but not always, has red feathering creeping down from the crown into the nape.